Pokemon Go gets people out and about – but only paying attention to their phone. The workout facility where I usually get my calorie burns is closed for a few days this week. So I set out for a little 5-mile walk in nearby Des Peres Park, only to be engulfed by a multitude of Pokemon GO players trying to find whatever Pokemon character that had been geo-located into the park that day. It was a very bizarre experience. I’ve heard about the popularity of Pokemon GO but I never really experienced it before yesterday. I went to http://www.pokemongo.com to get a little overview and I watched the video on their home page. It’s actually a pretty cool idea – using the interactivity of your phone as a geo-tracking gaming device to find Pokemon characters not just in your area, but all over the world. The reality was a bit different. 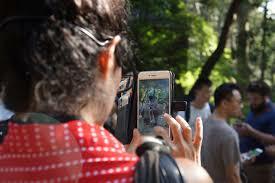 As I tried to stroll through the park, there were literally hundreds of people – mostly teens in clusters of three or four walking all around, all staring at their phones as they moved about. Upon arrival, I immediately knew that Pokemon GO had lured them to the park. It’s what you call a Poke Stop. That’s not a bad thing. But most of them had their heads down as they were walking. You had to avoid them – they were oblivious to your presence as they searched the park for Pokemon characters in their habitat. I saw a few people on bikes, riding and looking at their phones at the same time – a certain recipe for disaster. I had to step out of their way as they went by. There were a few others on skateboards, heads down, searching their maps, looking for where they might be able to throw a Poke Ball and up their level. It wasn’t all teens, either, who were transfixed by their phones. Lots of adults were in on the hunt as well. I saw a mom, pushing a stroller with two babies in it. Her concentration was entirely focused on the phone. You can’t really complain about a game that gets you out and about, off of the couch and out of the house. It also gets you to explore and maybe go places you haven’t gone before. It’s just when you have hundreds of people doing the exact same thing and their entire focus is the phone, it makes you wonder. Put Pokemon GO in place of golf and that pretty much sums up my feelings. Posted in Advertising campaigns, Interactive, lifestyle, Social Media, Uncategorized	| Tagged Des Peres Park, Pokemon GO! The last few weeks I’ve been totally occupied with trying to launch a BloodLinesArt product line on http://www.tom-blood.pixels.com where you can see a range of my paintings that are now also for sale on a wide variety of items – greeting cards, tote bags, iphone cases and throw pillows, just to name a few. 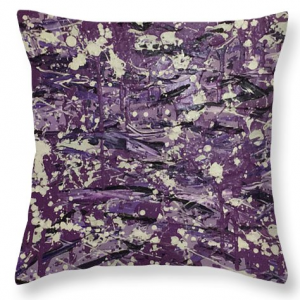 For some reason, I love seeing my art on throw pillows and that has caught a lot of my attention. I’ve had this website for not quite four weeks. In that time, I have amassed more than 1500 views of my artwork and yes, I’ve also had a few sales. But like anything, you’ve got to do your homework if you want to succeed and I have a lot more homework in front of me. One of two throw pillows that would look awesome on a couch! 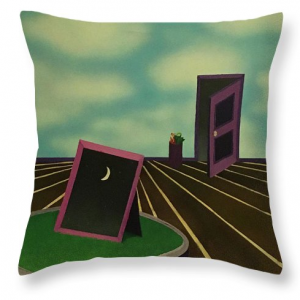 This one is called ‘Night’. This one is called ‘Day’. Imagine having these two side-by-side on your couch. Copy and paste that link into your browser and it will take you to that section. It will also put a few of my samples in the third row! I have a wide range of work. Some of it is kind of experimental. You might call it modern art. Others might call it abstract. 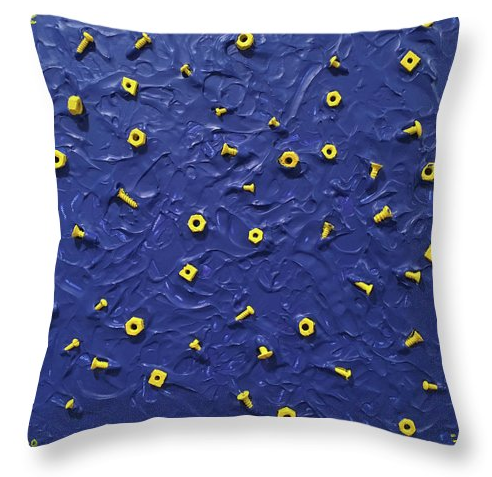 I just know that this is a really cool looking pillow. 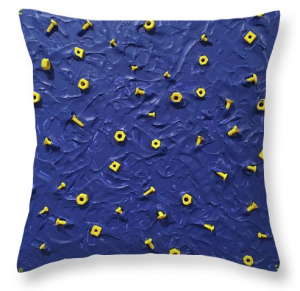 Nuts and Bolts – one of my ‘stick’ paintings looks really cool in the form of a pillow! Bottom line, I’m fighting for attention. I have a long way to go. And a lot more homework to do. 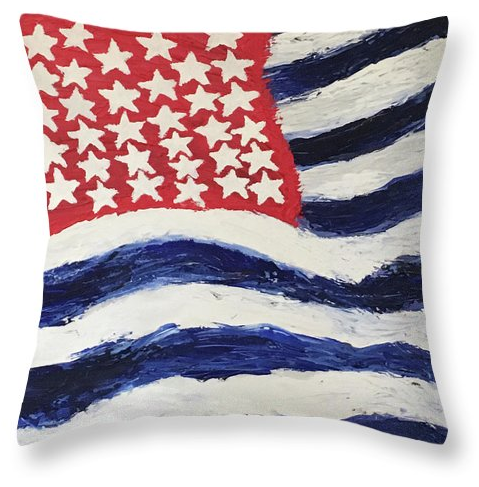 I would love to see sales of some of my art take off – it’s possible. Problem is, you spend more time trying to market what you’ve done than you do working on whatever’s next. We’ll see what happens. 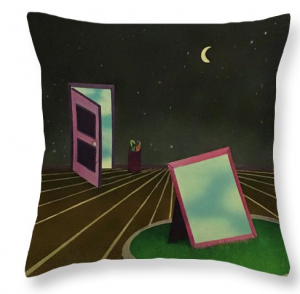 For now, can I interest you in a throw pillow?